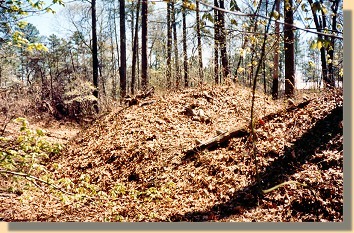 These earthworks are part of the strong Confederate defensive position known as the "Howlett Line." 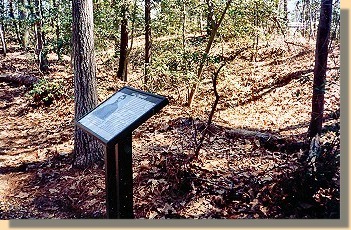 Composed of a string of interconnected redoubts and trenches, the line ran eight miles north and south and was named for the Howlett House which was located on the northern end, near the site of Battery Dantzler. With batteries housing large caliber guns anchoring the line on the James River to the north, and the Appomatox River to the south, the "Howlett Line" defended the eastern approaches to Richmond between the two rivers. 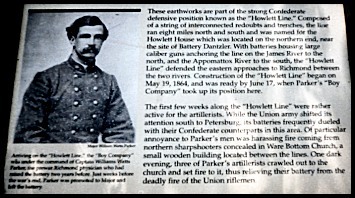 Construction of the "Howlett Line" began on May 19, 1864, and was ready by June 17, when Parker's "Boy Company" took up its position here. The first few weeks along the "Howlett Line" were rather active for the artillerists. 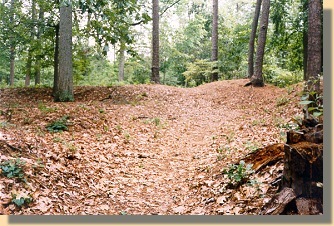 While the Union army shifted its attention south to Petersburg, the batteries frequently dueled with their Confederate counterparts in this area. Of particular annoyance to Parker's men was harassing fire coming from northern sharpshooters concealed in Ware Bottom Church, a small wooded building located between the lines. One dark evening, three of Parker's artillerists crawled out to the church and set fire to it, thus relieving their battery from the deadly fire of the Union riflemen. Arriving on the "Howlett Line," the "Boy Company" was under the command of Captain William Watts Parker, the prewar Richmond physician who had raised the battery two years before. Just weeks before the war's end, Parker was promoted to Major and left the battery. Photograph taken from inside the Battery.